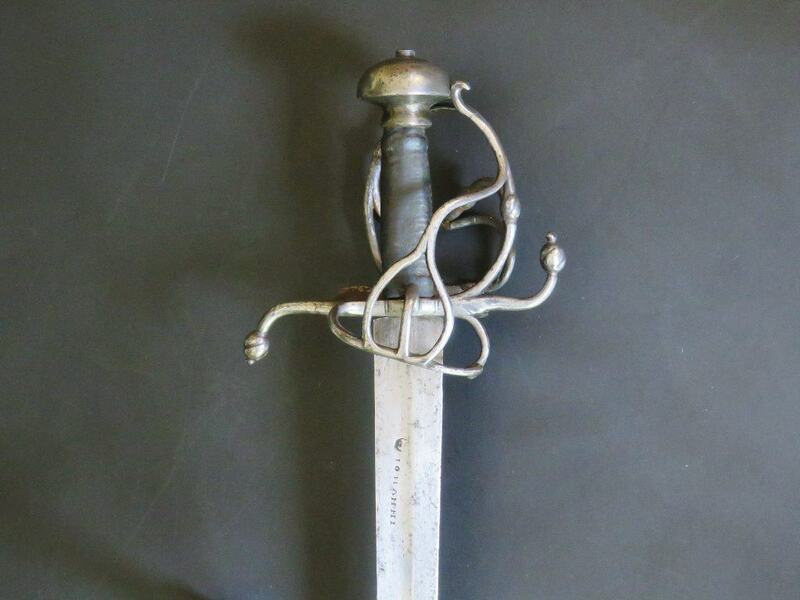 A scarce German military sword dating to the late 16th century. 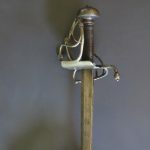 The single edged blade is over 30 inches long (76.5 cm) and is of stiff construction tapering to an acute point, used both for cutting and for thrusting through mail and the joins in armour plate. 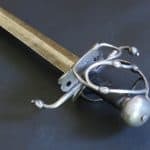 This is a “front line” weapon used at close quarters when massed ranks of foot soldiers in pike and shot formations crashed together on a battlefield. 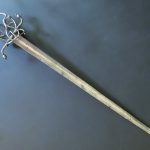 The blade is single edged for 22 inches (56 cm) of its length with a broad fuller extending for the same distance from the hilt under the spine after which the blade becomes double edged and of diamond section. 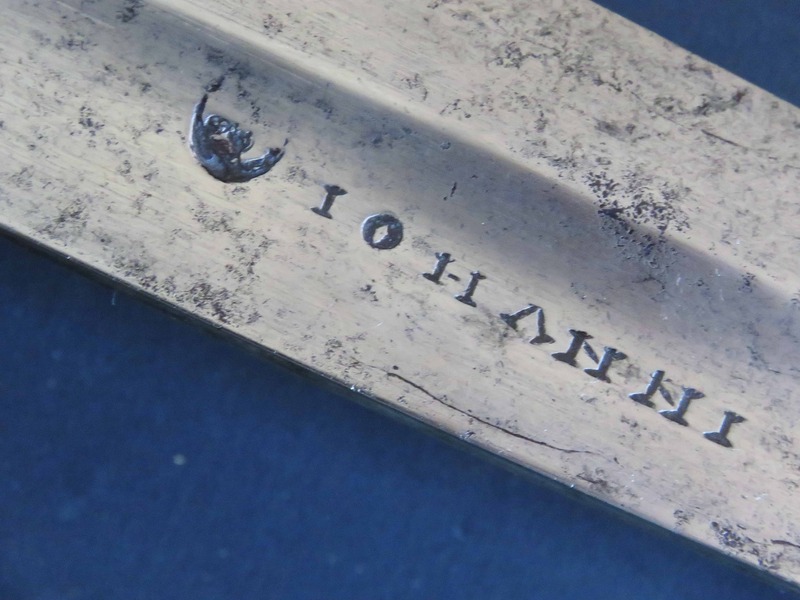 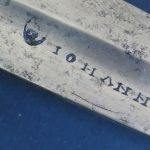 On one side of the blade near the hilt the makers stamp, of a face inside a crescent moon, has been punched, plus the maker’s name “I O H A N N I”, a Solingen maker. 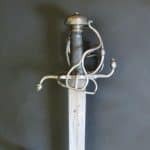 The complex hilt is comprised of two vertically counter-curved quillons ending in swollen terminals applied with linear engraving and knops. 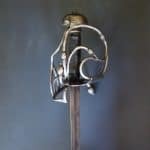 The frontal quillon turns upwards whilst the rear quillon faces downwards formed as a wrist guard. 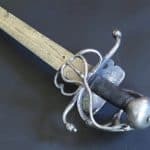 The hilt retains the earlier feature of a sloping thumb guard ring which dates back to the late 15th century to the beginning of complex hilt design and was soon to go out of fashion. 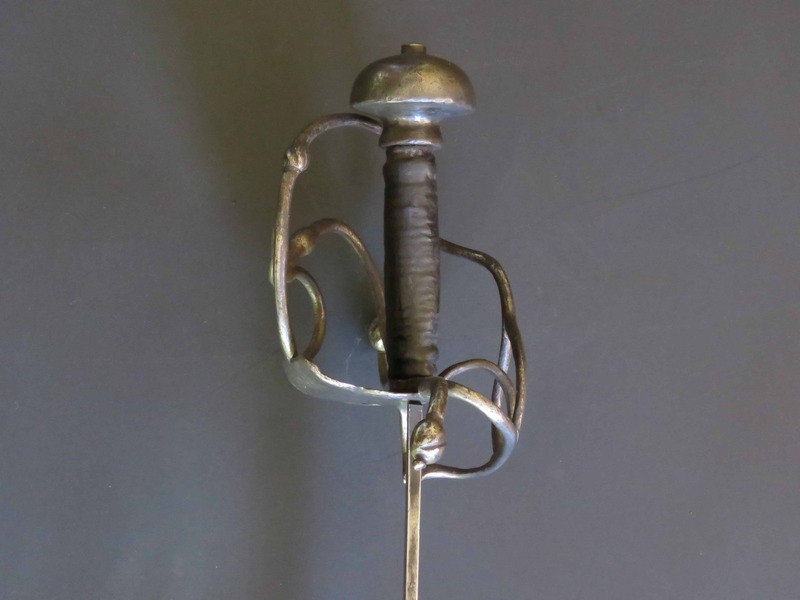 A thumb loop is attached to this and the quillon block. 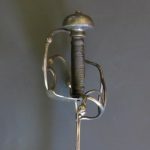 Two main guard bars arise either side of the thumb loop to merge above it to form a single bar which terminates in a forward pointing scroll at the pommel. 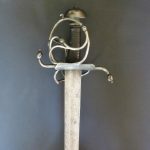 On the other side of the hilt a flat plate pierced with two circular apertures near the blade provides the basis of the guard protection. 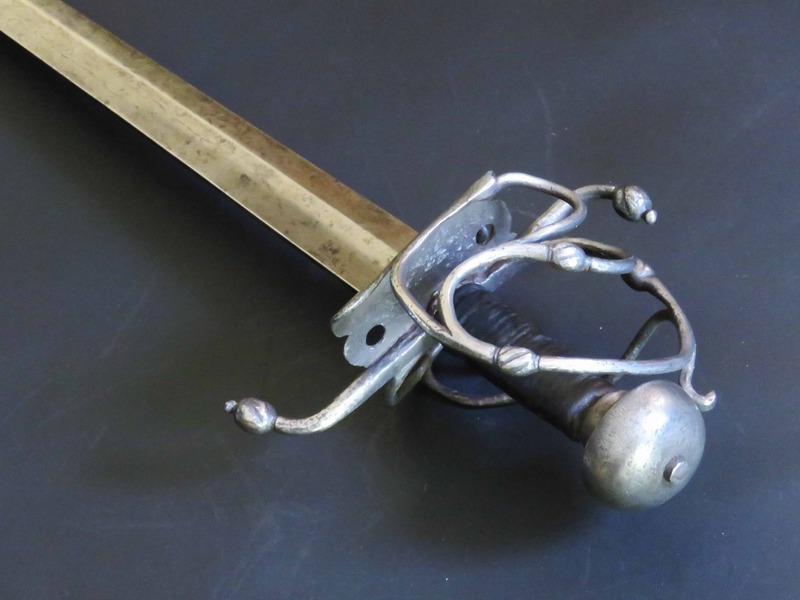 From this scrolled rounded bars rise to form a knuckle bow and side guards mounted with three knops similar in design to those mounted on the quillon terminals. 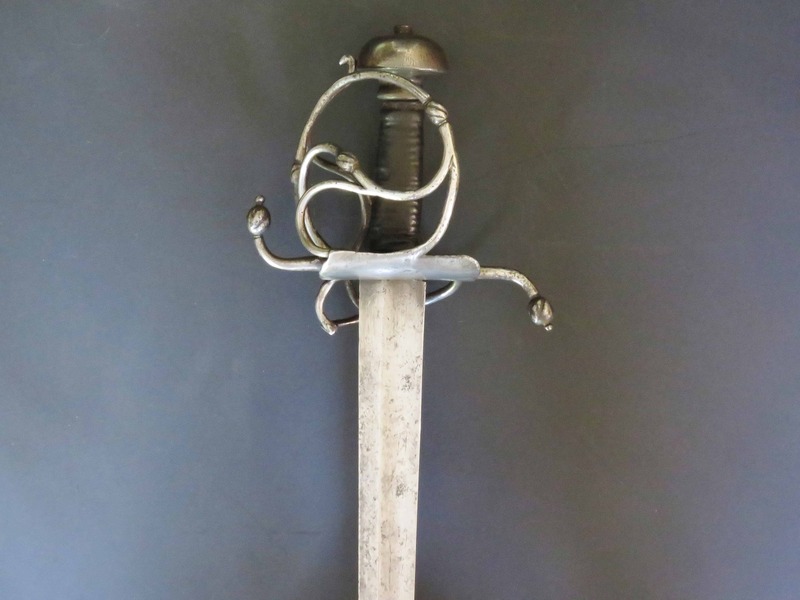 The solid pommel is mushroom shaped with a separate pommel button and flared neck below. 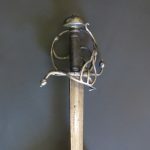 The wooden grip is original and covered with blackened leather applied over a cord wrap. 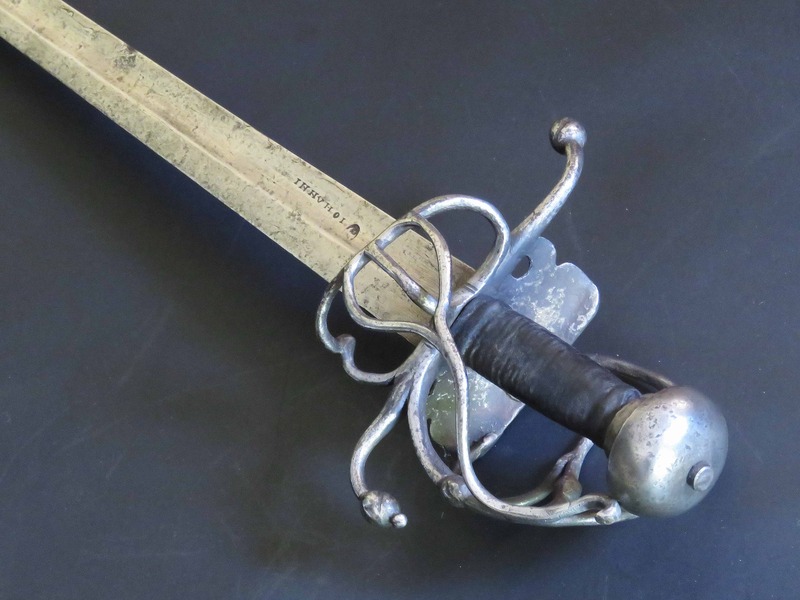 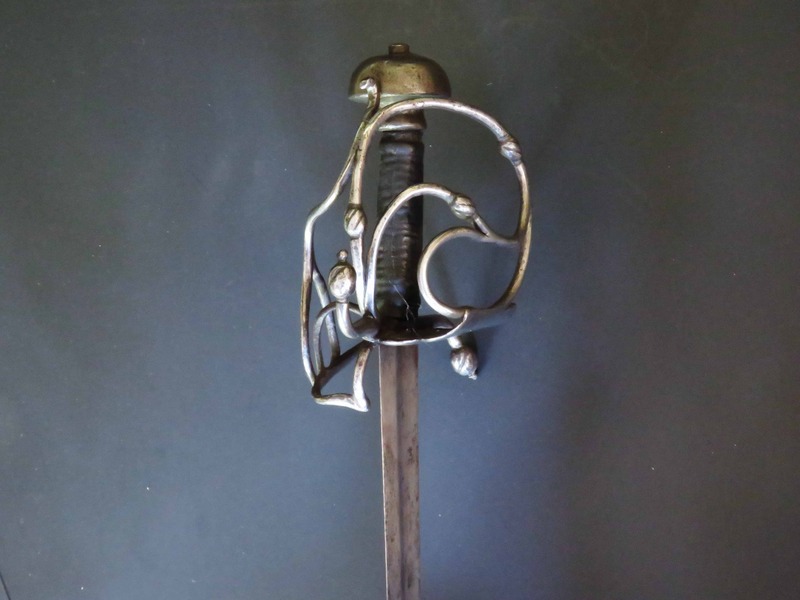 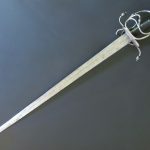 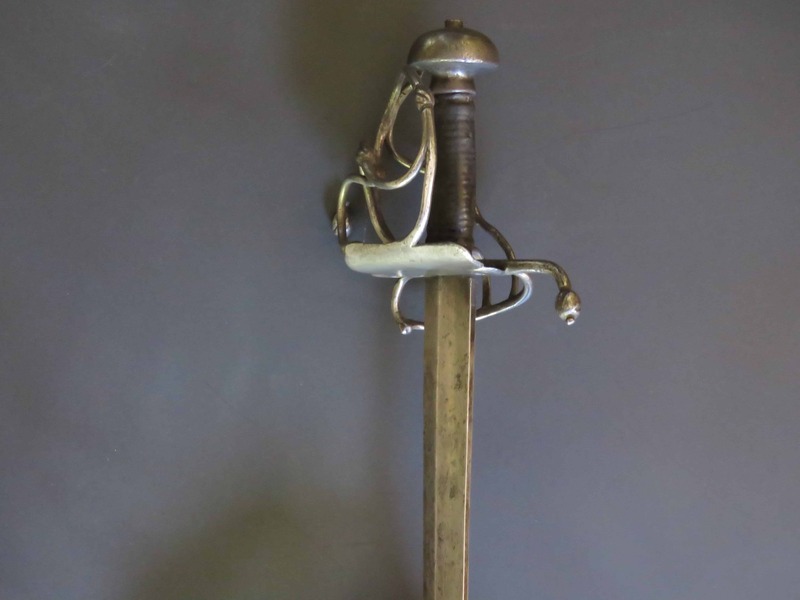 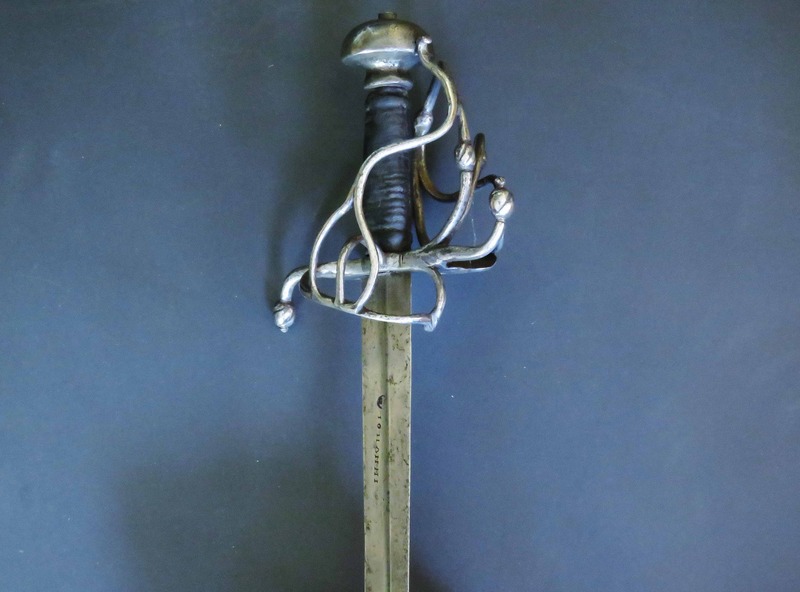 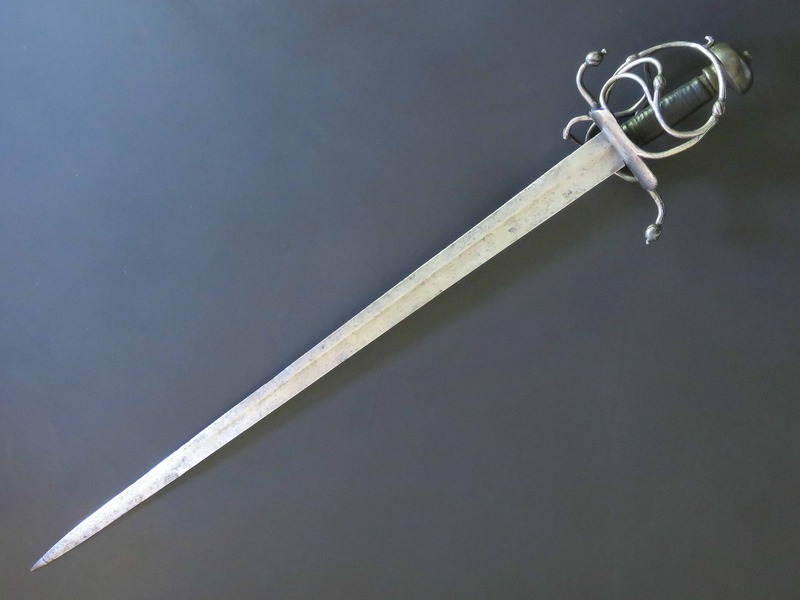 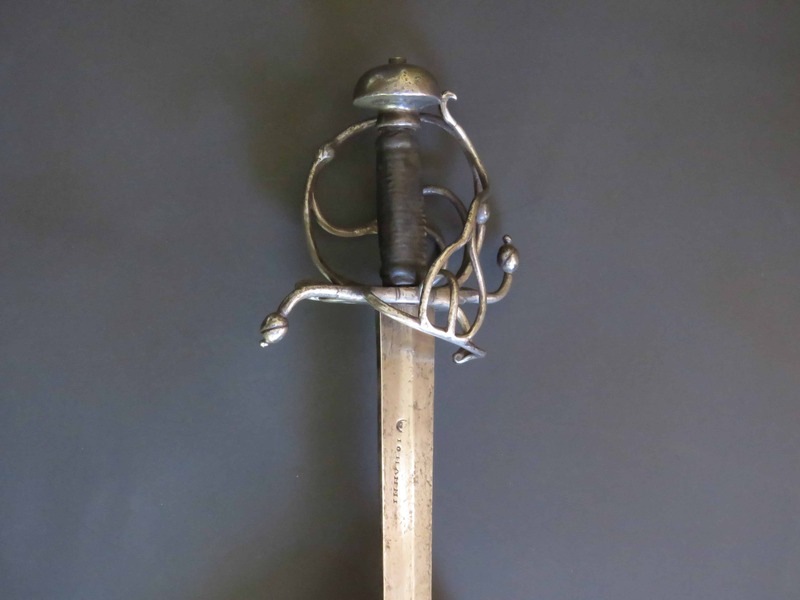 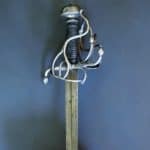 This is an interesting and rare sword which holds a place in the evolution of complex hilt design in the late 16th century, retaining some older features which were soon to become extinct as armourers adopted new ideas. 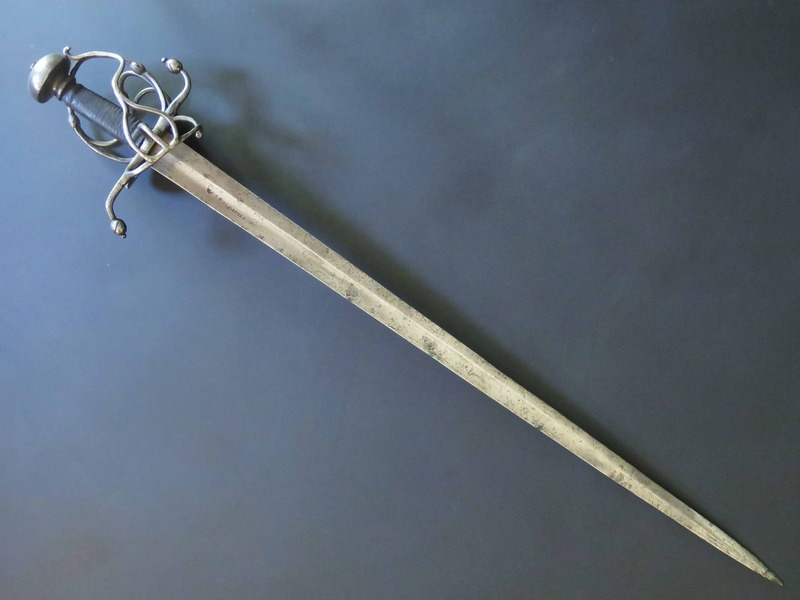 Overall length 35.75 inches (90.5 cm).